I listened to a woodworking podcast some time ago in which the hosts were talking about the amount of time that it takes to build a project. The focus of the discussion was on being efficient in the shop, and getting something tangible accomplished every time you are in there. Of course both of the hosts were long time professionals, but what was most interesting to me was that there was this connotation that traditional woodworking using hand tools was less efficient than running everything through a machine. Of course, my research has shown otherwise, as I have shared with you in some of my most recent posts. However, it got me thinking. What is it about working wood with hand tools that invigorates some craftsmen and frustrates others? This tall chimney cupboard took me just over 2 weeks to build from the first saw cut to the point you see here, ready for paint. That was working part time, just a couple of hours a day, and not every day. Generally, I think personality type has a lot to do with it. Some folks are extremely product oriented. If you are a mover and a shaker with the textbook type A personality, you probably fall into this category. The goal for you is to get it done. You need to see the fruits of your labor as soon as possible. If a project takes too long to complete, you lose interest and move on. Your biggest influences in woodworking are Norm Abrams and Tim The Toolman Taylor (more power!). In your mind, the time required to obtain the skills to use hand tools is better spent “being productive”. So you just can’t be bothered, and no one is going to convince you otherwise. At the other extreme are those who are all about the process. If you are into yoga, meditation, and the zen of everything, then this might be you. When you’re in the studio, it’s not about the destination, it’s all about the journey. You might have ten different projects in various states of completion scattered around the room. You’ll finish them eventually…maybe. But if you don’t, that’s OK, because for you, woodworking is all about becoming one with the tools, and the connection to the tree. You love your hand tools because they put you in touch with the inner soul of the wood, and allow the wood to become what it wants to be. 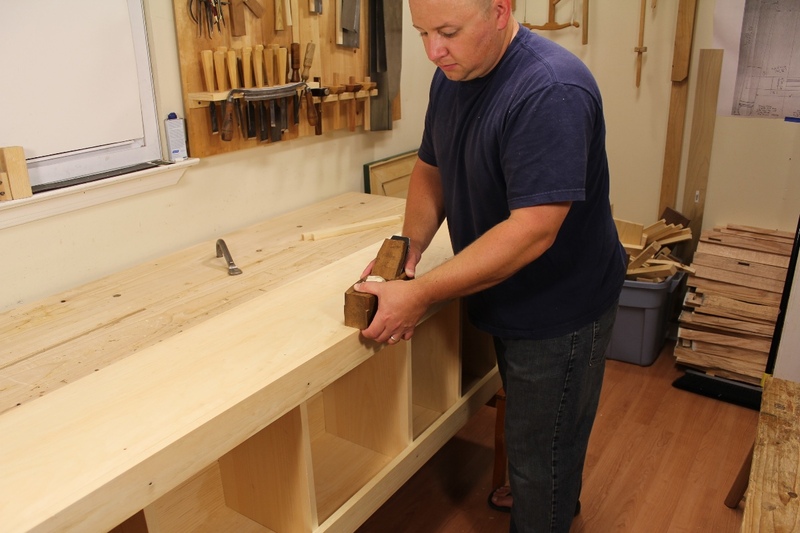 Planing the face frame of this cupboard flush with the case side is exponentially faster than using a power sander, and results in a finish ready surface. Then there are those of us that fall somewhere in the middle. We love the process of using our hand tools, but we still want to get things done. Luckily for us, there are ways to be efficient with hand tools. The historical evidence is clear that our ancestors were extremely efficient. They had to be. They were the epitome of the product oriented craftsman, but they had to do it all with hand tools. So by looking at traditional practices, we can gain some insight into how to be more efficient in our work. I have been extolling the efficiency of colonial cabinet makers for years, and have personally confirmed that using hand tools does not have to be a slow and tedious process. The cupboard pictured above is a fairly traditional form that I built completely with hand tools. I built this piece in just over two weeks time, working part time, just a couple of hours a day. 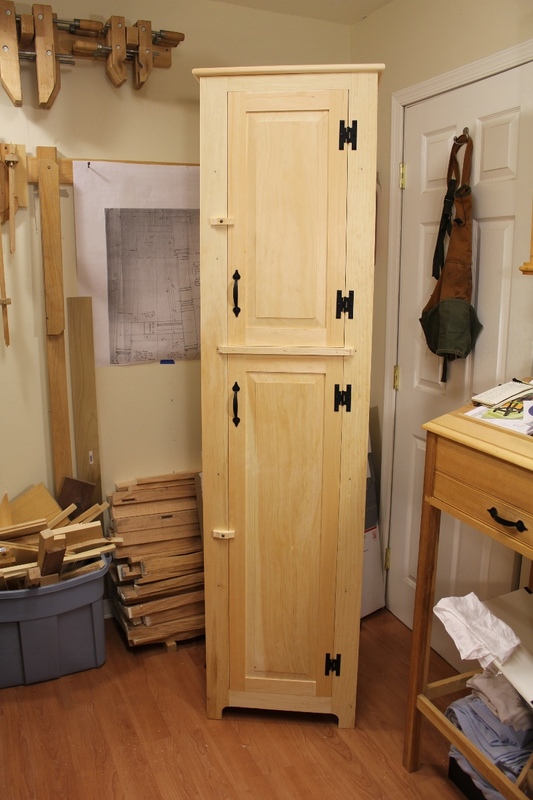 Had I been working full time on the cupboard, I estimate that I could have had it built to the point pictured in the first photo above in just two to three days of work. Over the last few articles, I’ve discussed some ways that hand tools can be used more efficiently (see here, here, here, and here). Some of the methods were uncovered by studying period furniture and texts. Others were discovered through my own experimentation. All have improved my efficiency and allow me to enjoy both the process and the product. I hope you can do the same as well, because, after all, that’s the reason we do this in the first place. Posted in Random Thoughts and tagged efficiency with hand tools, process. I have been enjoying these posts about how to work efficiently. I think one of the thing that is really putting people off hand tools, is the fear of all the hard work. It certainly was for me. Learning how to plane or resaw a piece of wood is not that hard, but it certainly is hard work. At times I mostly feel that I am getting nowhere with my projects, because dimensioning wood by hand takes a lot of time – compared to using machines for the same tasks. Lately I have begun to think more about where to concentrate my effort. Not all parts have to be flat or straight. Some parts can even be bent into place without much effort. And without any negative effects on the outcome of the project. That is where you can really save time. This is something that I have really started thinking about lately. I feel like there is very much to learn about cutting corners and skipping work in certain places. And I think that lack of this knowledge is mostly what is keeping me from working efficiently. Knowing these things motivates me and it takes some of the “fear” out of woodworking. It also makes me want to try my hands at larger projects. I think we need more focus on these things, and both you and “Mortise and Tenon” magazine is doing something about it. I dont think that they were cutting corners. I just think that is what some people think that they are doing, when they are working less accurately. I used to think that all parts had to be perfectly flat and smooth on all faces. Today I don’t. Now I try to figure out, as best I can, where to concentrate my effort. Some times applying accuracy selectively, makes me feel that I am cutting corners. But mostly I am just making things easier on myself. The good thing about that, is that I get things done faster, with less hard work and with equally good results.